"Why don't we have a try then?" Following J.D. 's advice, several people sat down and began working on their own pieces, while Peter was lucky enough to be guided by the master Liang herself. "It's the only known canvas art that's viewed equally from both the front and the back. It takes a good eye, precise stitching and incredible patience," the old man commented. Half an hour was not long enough for the novices to finish their maiden pieces, but the participants truly enjoyed the process nonetheless. "Embroidery is youth, embroidery is life!" The cheer from the crowd marked the end of this fantastic trip, as all the expats took a group photo with Liang in front of her workshop. 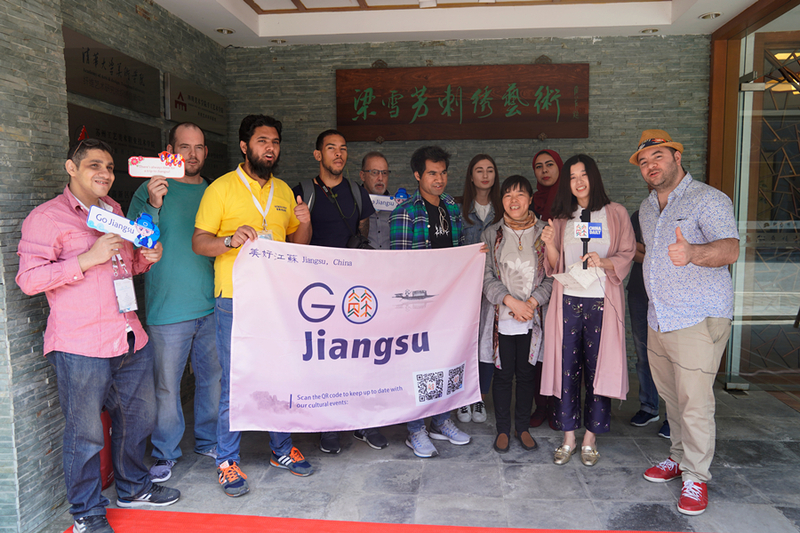 As a promotional cultural event, the embroidery festival offered something for these curious foreigners: an opportunity to make new friends, fun activities, an escape from the hustle and bustle of urban life, and the opportunity to experience the culture of an old civilization. Given the success of the event, it wouldn't be a surprise to see similar events become a staple of the Suzhou calendar.